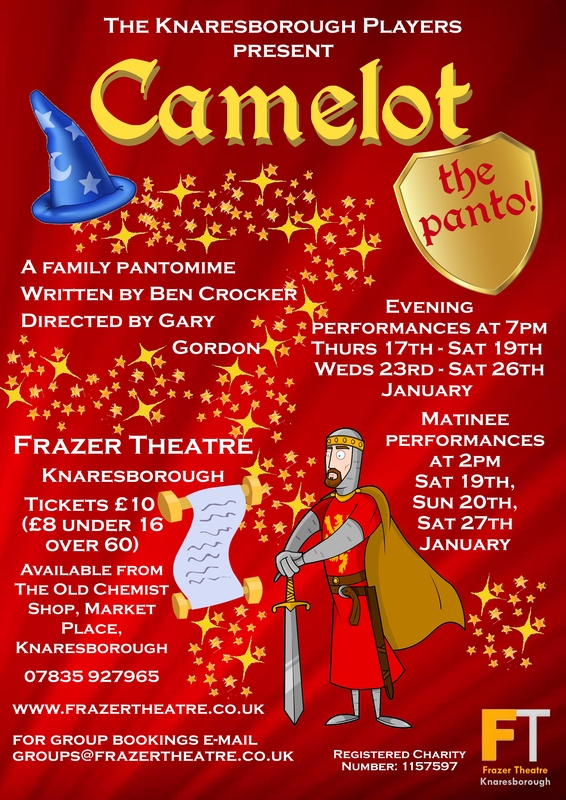 The Knaresborough Players will once again be providing an extension to the festive period with their annual family pantomime which runs from Thursday 17th to Saturday 26th January 2019. Come one come all to ‘Camelot – The Panto!’, a show which is sure to be fabulous fun for the whole family – as the legend of King Arthur is retold in this traditional Pantomime with a modern twist. Camelot tells the story of the love between Princess Guinevere and the handsome Prince Arthur. The romance appears doomed to failure when the Princess is kidnapped at the wedding by the evil gang of Morgan Le Fay, Valerin the Vicious (and his Mum) and knights Marlon and Garlon. Can Nurse Connie Clatterbottom, her friend Laughalot, a dancing bear called Teddy and (of course) Merlin save the day and rescue the princess? The show promises to be bursting with larger than life characters, spectacular musical numbers, family- friendly laughs and plenty of magic! Tickets are £10 (£8 for over 60s and under 16s) and are available from our online box office by clicking Buy Tickets or by calling 07835 927965 (credit/debit card payment required at time of booking) or in person from The Old Chemist Shop, Market Place, Knaresborough. Children under the age of 2 do not require a ticket but will be required to sit on the knee of a member of your party. If you require a seat for them, please purchase a concession ticket. Evening performances start at 7pm with doors opening at 6:30pm. Matinee performances start at 2pm with doors opening at 1:30pm. Seating is unallocated and cannot be reserved in advance (with the exception of group bookings). Please arrive in good time to ensure your party can be seated together. The performances will last approximately 2 hrs 30 minutes including an interval. 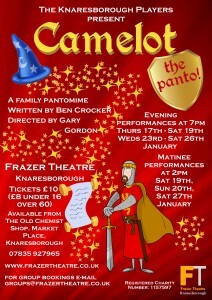 Group bookings (10+ tickets) can be made by e-mailing groups@frazertheatre.co.uk. Please note that for all group bookings payment will be due by Thursday 10th January.